Youth America Grand Prix 2015| Final Round & the Stars of Today meet the Stars of Tomorrow…. One on the great pleasure in living in New York City is the annual appearance of the Youth America Grand Prix at Lincoln Center‘s David H. Koch Theater Each year YAGP presents two nights in which some of the best dancers in the world are put on display. First presented it the Final Rounds of the Youth America Grand Prix in which the young dancers that have made it to the final round of the competition perform Stars of Today Meet the Stars of Tomorrow Gala takes place the next evening. It is a much awaited for event in which the students showing the most potential perform alongside some of stars of today’s leading dance companies. The evening was hosted by Julie Kent from American Ballet Theater and Jared Angles from the New York City Ballet. Of the sixty dancers that made it to the final rounds everal American dancers came away with top spots. Rio Anderson from San Francisco won 2nd place in the Senior Women’s Division and was also awarded a year round Scholarship to the Royal Ballet in London, as well as an apprenticeship with the Dutch National Ballet. New York native Juliette Bosco, age 12 and Maggie Chadbourne, age 13 from Orland actually tied for 1st Place in the Junior Women’s division. When the curtain opened for the Final Rounds, Connor Hamilton, age 12, gave a stunning interpretation of the Variation from Giselle. She was so tiny, so petit and danced wonderfully. 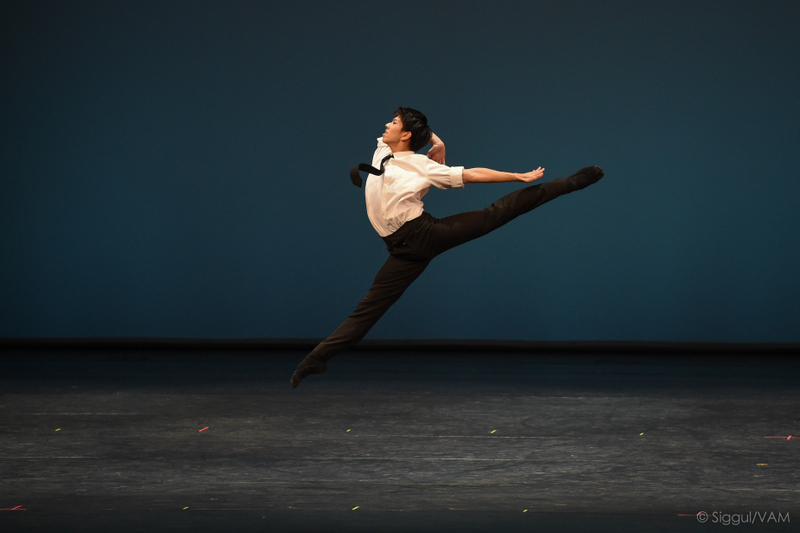 Shogo Hayami, age 18 from the John Cranko School in Germany performed an exciting tour-de-force performance of the Variation from Don Quixote. He is someone to watch…. It is customary during the Stars of Today Meet the Stars of Tomorrow Gala that the top ranking dancers chosen from the night before perform during the first half of the program. After the intermission dancers from some of the best dance companies in the world are presented. In the first half of the program, Stars of Tomorrow, Shogo Hayami, age 18, the first place winner in the Senior Men’s Division performed Mikis Theodorakis’ Solo for Diego. The piece calls for a certain level of drama that is still tongue-in-cheek, yet, the performer must have superb technical ability to full express the character being portrayed. I have seen this piece performed many times but rarely as smoothly as Mr. Hayami’s. I will be interesting to see where this gifted young man will begin his professional career. Austen Acevedo, age 15, came in 6th in the Senior Men’s Division. During the Final Rounds he and Kennedy Kallas, age 14 gave a riveting performance of Yuri Smekalov’s Who is My Shadow. Both dancers displayed a maturity far beyond their years. It is an intriguing contemporary duet that the couple had premiered at the Mariinsky Festival held in Russia at the Mariinsky Theatre. They are the first pre-professional American dancers to perform on the Mariinsky Theatre stage. The Stars of Tomorrow opened with Calvin Royal III from American Ballet Theater and YAGP alumni with partner Katrina Shapran (Mariinsky Ballet) performing Anton Primonov Untitled. 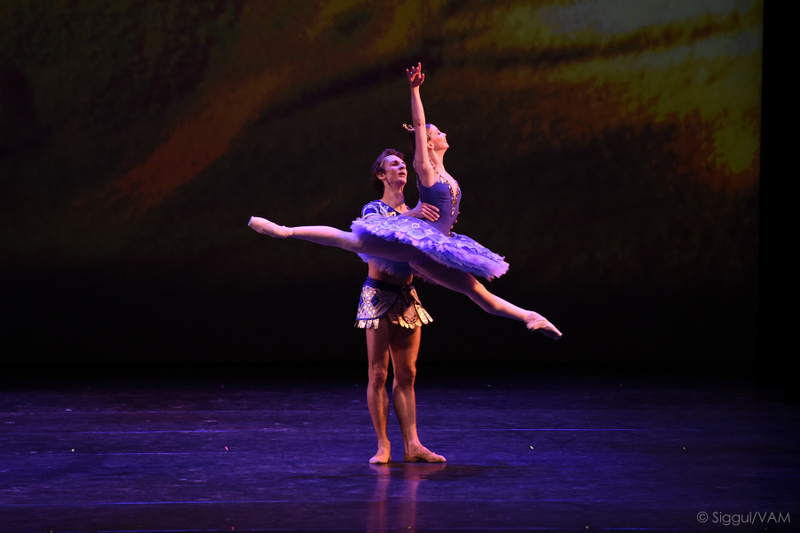 It was the work’s world premiere, presented as part of YAGP’s Emerging Choreographers Series. Though beautifully performed the piece itself felt somewhat lacking. The Bolshoi stars Evgenia Obraztsova and Semyon Chudin performed a Pas de Deux from The Pharaoh’s Daughter which I was excited to see. Ms. Obraztsova was flawless but it was Mr. Chudin who grabbed the eye. I do not believe I have ever seen a male body more suited for dance. His line is lean and impeccable. He grabs you and pulls you into his performance. Xander Parish, the first and only British dancer with the Mariinsky Ballet, gave an athletic and rousing performance of the amusing Eric Gauthier’s Ballet 101. The work displayed Mr. Parish faultless technique and gave witness to why he was selected to dance with the Mariinsky Ballet. The Youth America Grand Prix mission is to support and develop world-class dancers, ages 9-19, of all economic, ethnic, and geographic backgrounds by providing scholarship auditions, performance and education opportunities, and by serving as the global network of dance, connecting students, teachers, schools, dance companies, dancers, and audiences. YAGP reaches over 7,000 dance students annually by holding workshops, scholarship auditions, master classes and audition classes in approximately 15 U.S cities and 5 international locations. Each season culminates in the week-long New York City Finals, where more than 1,200 of the world’s most promising dancers receive in-depth mentoring and greater scholarship, professional, and performance opportunities. Only 300 of most promising young dancers representing 30 countries on 5 continents are chosen for the New York City Finals. Open to general public, the Final Round gives the New York audiences a unique opportunity to see 60 of the world’s best young dancers before they disperse around the world to study on scholarship at the world’s leading dance academies (over $300,000 in scholarships are presented annually at YAGP). « New York City Center Presents the Eifman Ballet of St. Petersburg in the New York Premiere of Boris Eifman’s Newest Ballet “Up & Down.” May 22 – 24, 2015….